After the quite decent Sorrow and Skin, the band continues in the same vein, utilizing temperamental drumwork to increase heart-rate, so the Deeds of Flesh and Deathcore influences sip through. The guitar work exhibits the stereotypes of modern death metal, yet through “Dawn of the Angry” overdub orgies, arpeggios and bluesy solos, technique serves the composition. On the self-titled track, sonic violence melds with disintegrated melodies – which feel so due to the use of string bending and other chromaticism inducing guitar techniques. The band overall knows how to write songs using a death metal rhythmic and narrative approach. This is due to separate instrumental work – which relies a lot on drum-guitar interplay, but don’t forget the flexible and guttural vox – doing the tracks justice. The vocals scream tales of splatter which are painted by the rest of the band to immerse the listener in a headbanging frenzy. 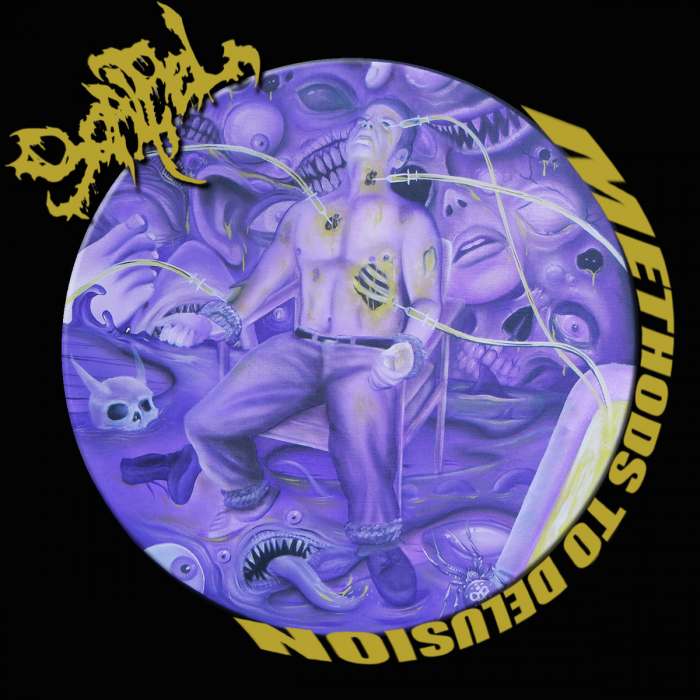 For example, strange ideas are used, such as the swing rhythms on the first track, that mimics the Cleaner, joyfully doing his work, and those ideas are perfectly absorbed into the Death metal structure and help the listener to follow through without pretending to be novel. In the end, it seems that skilled musicians that do not lack purpose and metal spirit can write effective songs, especially when they have a story to tell. The only main drawback of the album is the approach itself: the over reliance on rhythm and not internal dialogue, although enjoyable, limits the re-playability of the record and its climactic potential. Additionally, some endings feel rather abrupt, which is both a good and a bad thing. For example, in The Stink a technical harmonic arpeggio is followed by a heavier reply which lasts a while and then the song ends in an abrupt climax, unfinished yet fitting, like sudden death. Yet, some other tracks do not end in a way that is fulfilling, such as the exordium of the record. Nevertheless, Scalpel has improved volumes composition-wise compared to Sorrow and Skin but there is a lot of potential for such good musicians, especially considering the simpler but more essential riffs and ambitious ideas on their first album – note the pause in the middle of Ripe, great compositional articulation. On the other hand, Labors of Loathing exhibits pauses and changes in a form of internal dialogue between people engaged in combat: the dialogue is short in information but does not continue for long since the song collapses into itself. Generally, their sound has been greatly refined to accommodate their technical growth and the production values are worthy of note as they put every instrument on the spotlight, yet help the band shine as a whole. Overall, the band works like a clockwork mechanism, coordinated and purposeful, constructing their language through great drum-work and imaginative riffing, that sublimates their influences into quality death metal, which is modern yet steeped in the past. Very strong Mortal Decay vibes on this one.